A copper engraved map by Henricus Hondius in an early state, possibly a first state. A very detailed map of Iceland with a large, decorative cartouche, a small vignette with dolphin heads, a scale of miles and two wind compasses plus various ships and fish in the sea. 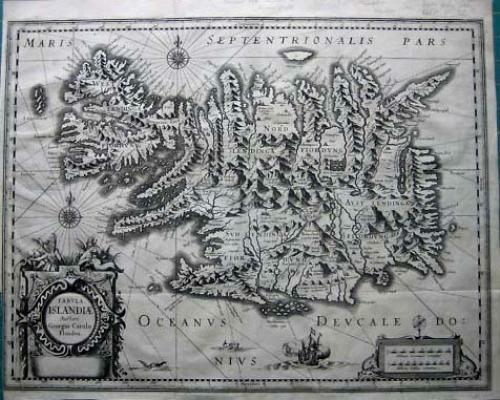 This map is very similar but slighly different to the Blaeu plate. In very good condition with blank on the reverse. The map has additional folds as it was part of a much smaller book (possibly a 4to atlas). The left hand lower side is cropped due to folding into the book and there is one old repair to very small tear. Overall excellent condion and a very strong impression.